Many undocumented individuals who leave the United States, voluntarily or through deportation, face huge financial challenges in Mexico. Lack of credit history, stable employment and collateral can make it hard to obtain even a debit card, and qualifying for loans is practically impossible. 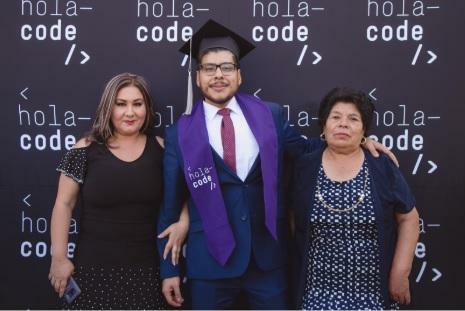 Thankfully, Miriam found Hola<code/>, a Kiva Field Partner and Mexico City-based social enterprise that offers one solution for students eager to build their careers but without the financial resources needed. The organization promotes access to high demand employment for financially excluded youth by offering them an immersive, career-led software engineering bootcamp. The bootcamp is a 5-month program that teaches students all the skills necessary to become full-stack software engineers. Hola<code/> tuition is deferred, meaning that students don’t pay for their educations until after gaining employment. “It’s a program that helps students integrate into Mexico through education and technology,” Hola<code/> founder Marcela Torres says. She explains that students’ bilingual skills gives them an advantage because it enables access to a broad range of high quality technical literature, especially documents written in English. Because students don't pay tuition upfront, the program needed to acquire financing from somewhere to act as a stopgap. This is where Kiva comes in: Kiva lenders crowdfund loans for the students of Hola<code/>. Miriam is one of the students who completed the Hola<code/> program with support from Kiva lenders. Her $6,000 loan was fully funded in less than 30 minutes. Now, she works as a software developer at Segundamano. She started 2 weeks after finishing the Hola<code/> program. In addition to new opportunities, Kiva and Hola<code/> are giving students a platform on which to tell their stories. 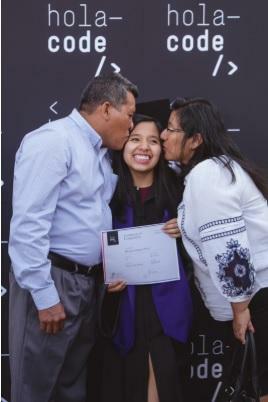 Most students had been living in the United States for the majority of their lives before being deported to Mexico for minor legal infractions, like driving without a license. Another student, Alex, was working at a call center in Mexico City before signing up for Hola<code/>. Alex lived in the United States from the time he was very young until just before high school. He was a football player and was getting some interest from prestigious universities like the University of Southern California. Then he had to come back to Mexico. But getting into college, he says, proved challenging. Because of the lack of affordable, quality public higher education, unless you come from means and are able to attend a private college, gaining admission to one of Mexico’s top universities is incredibly difficult. Today, Alex is working for Clip, one of Mexico’s largest finch companies. His loan, also $6,000, was funded by Kiva’s community of lenders in 45-minutes. He doesn’t hesitate to think hard about his future. 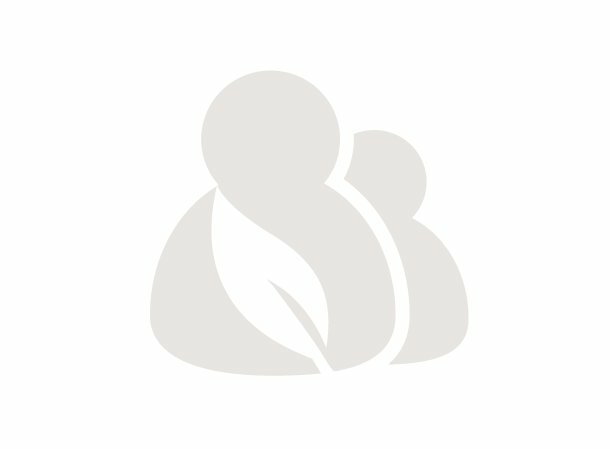 Alex is cofounding a company with one of his Hola<code/> classmates to manufacture high-end computers for gamers. That's changed, he says. And then he pauses for a moment before speaking again.